Gerade in der Forschung ist das FabLab hilfreich, um Ideen schnell praktisch umzusetzen und weiterzuentwickeln, und bietet damit eine gute Ergänzung zu klassischen Werkstätten mit Auftragsfertigung. Auf dieser Seite stellen wir wissenschaftliche Arbeiten vor, die im oder mit dem FAU FabLab entstanden sind. Wenn du weitere solche Arbeiten kennst, schreibe uns bitte. 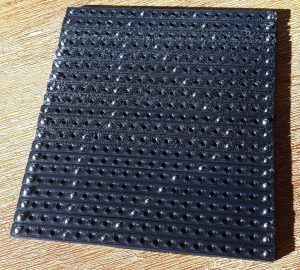 Wenn auch Du das FabLab für die Forschung verwendet hast, sind wir sehr an einem Beitrag zu dieser Seite interessiert. Im Idealfall sind das 2-5 Sätze, welche auf Englisch die Arbeit und den Zusammenhang zum FabLab zusammenfassen, ein Foto, ein Kontakt und eine zitierbare Quelle oder Link. Hammer J., Gaukler M., Kanzler P., Hörauf P. and Novac D. (2017, September 13). 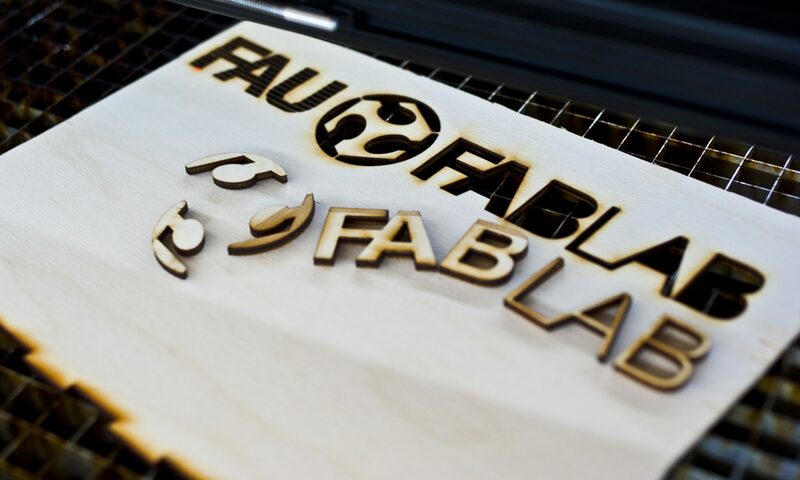 FAU FabLab: A Fabrication Laboratory for Scientists, Students, Entrepreneurs and the Curious. 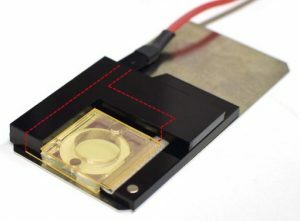 André Aichert investigates calibration techniques for flat-panel detector computer tomography systems. During his research he required a configurable phantom – a precise target with known configuration – to relate reality to the detected image. Using 3D printers at the FAU FabLab a placeholder phantom matrix (pen) was created, which allows metal bearings balls to be placed in a precise way. The metal balls can then be „seen“ by the X-Ray detector and used for calibration. Navid Bonakdar, from the Max Planck Institute for the Science of Light (MPL), built a chamber for the fabrication of giant lipid vesicles as a model systems for cell membranes. This allowed researchers from MPL and FAU to evaluate membrane model systems for an overview study under physiological conditions. Martin Schütz et al. introduced a novel, tailor-made UAV-based sensor platform, HeliSAR, that potentially allows interferometric SAR remote sensing based on a bistatic MIMO radarsystem. Many parts of the system were build in the FAU FabLab, using the CNC mill, laser cutter, 3D printers, circuit board etching and many more capabilities. In their publication, Schaller et al. investigated the local building blocks of packings of aspherical grains, found in granular and glassy systems. In order to demonstrate their findings, they made use of the FabLab to produce 3D printed physical representations of local structures. Heart valve implants represent the standard method to treat severe malfunctions of human aortic valves. To further optimize biological implants, their tissue component out of, e. g., porcine pericardium, need to be characterized in detail. During my master thesis I developed a test station for biaxial tensile testing of biological tissue. The FAU FabLab supported me by providing a laser cutter, so that tensile samples could be cut out of the tissue and the measurements of porcine pericardium could be realized. Robert Weigel modelled ellipsoid packing for his Bachelor’s Thesis. 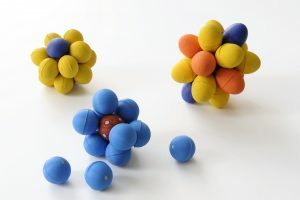 Such models are vital for the understanding of unstructured material packing processes with materials such as sand or glass. To visualize and demonstrate the theoretical work 3D printed ellipsoid structures were produced in the FAU FabLab. 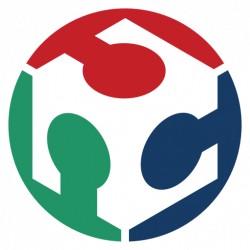 Locally Densest Packings of Ellipsoids per Simulated Annealing. 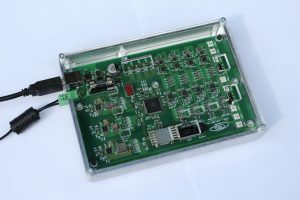 Toni Bartsch used the FabLab during his bachelor’s thesis, designing a programmable constant and spike free power supply for integrated circuit testing. For safety and practical use in a research and testing environment, a protective case out of solid aluminum had to be designed and manufactured, as well as an acrylic front cover. Timo Voigt investigated in his Bachelor’s thesis the application of a laser cutter for bending of acrylic. Thus, extending its capabilities from a 2D cutting to a 3D sheet prototyping machine. The Eu:CROPIS satellite is developed by the German Aerospace Center (DLR), simulating the effects of lunar and martian gravity on germination and growth of tomato plants for future interplanetary missions. 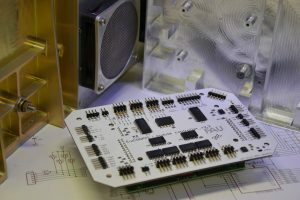 Sebastian Strauch, researcher at the Cellular Biology research group, used a laser cutter at the FAU FabLab to manufacture Mylar foil stencils needed in production of a circuit board used on board of the satellite. In the investigation of quasicrystals by Sebastian Kapfer, a two dimensional model was cut out of acrylic at the FAU FabLab. Quasicrystals include additional degrees of freedom (phasons) over the ones known from periodic crystals (phonons). How these lead to new kinds of topological defects is currently being investigated.